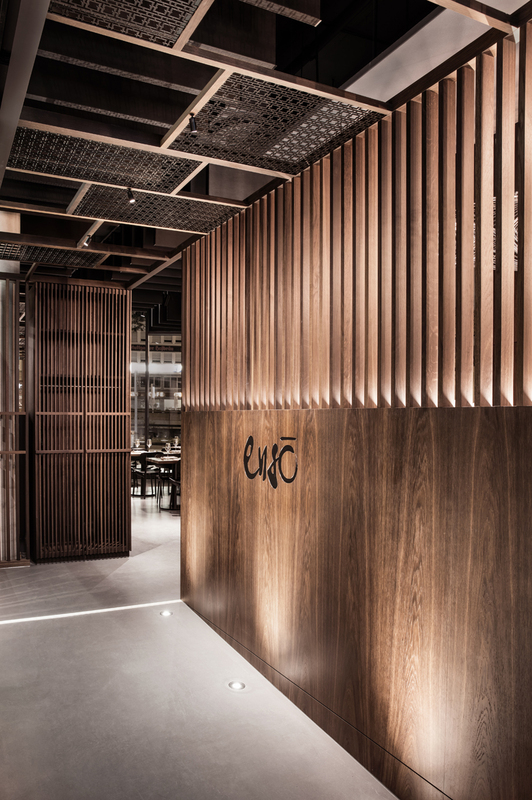 dittel architekten designs the fine food restaurant ‘enso sushi + grill’ in a prime location in the dorotheen quartier shopping mall in stuttgart, germany. 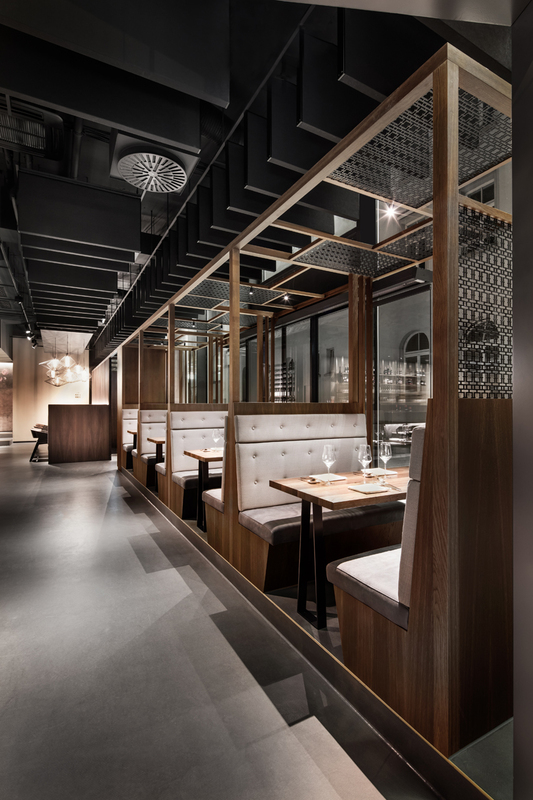 the modern design is as sophisticated and creative as its asian-european fusion cuisine. 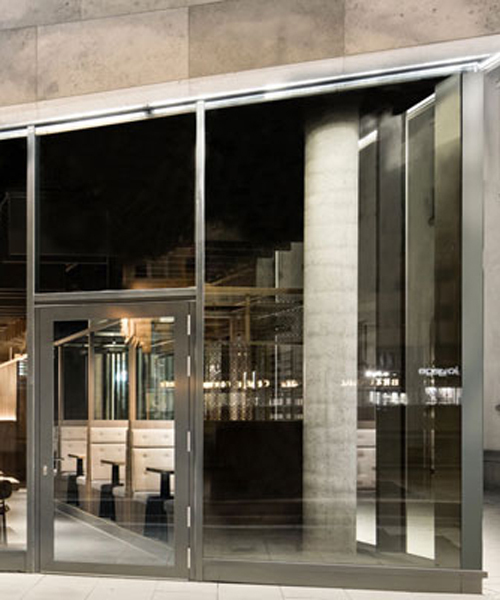 an oak vestibule engraved with the restaurant’s logo guides the customers inside. this feature sections off a slightly elevated seating area that consists of four cozy seating alcoves. sectioned off by frames embellished with asian-inspired decorations, these small nooks are popular among guests, providing an open view both into the restaurant and outside. artistically designed meals are enjoyed while being seated at solid wooden table tops set on delicate, canted steel table legs. 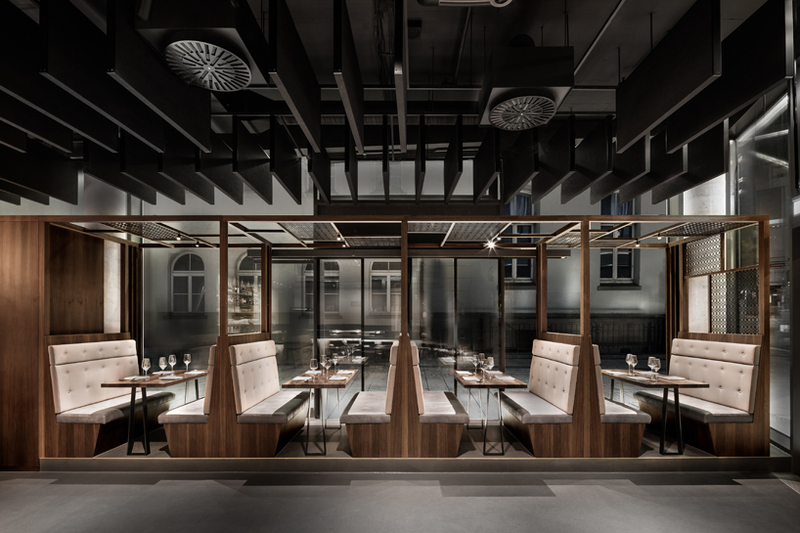 the german based dittel architekten features on the opposite side of the dining area a bar and a live sushi counter, extending along the window façade. 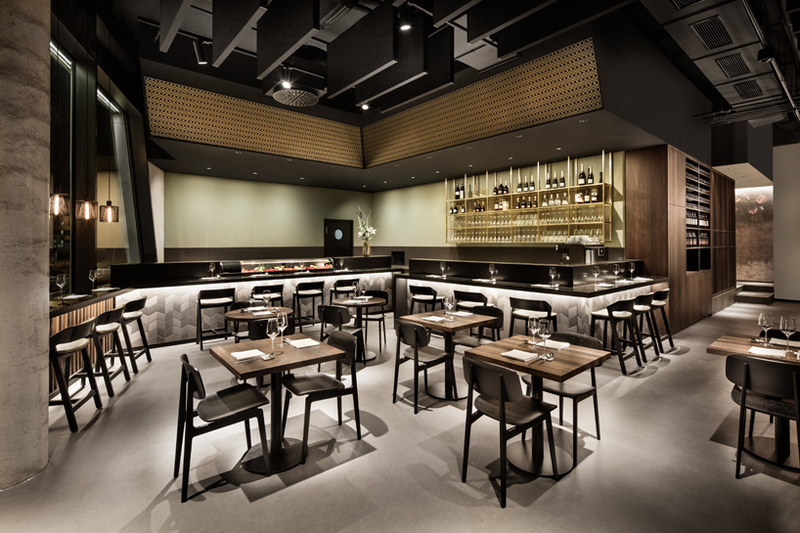 customers who stop in to enjoy a glass of asian whiskey or watch the sushi chefs at work will find the perfect spot on the elevated barstools. whereas, the dining area is set up for traditional seated meals. 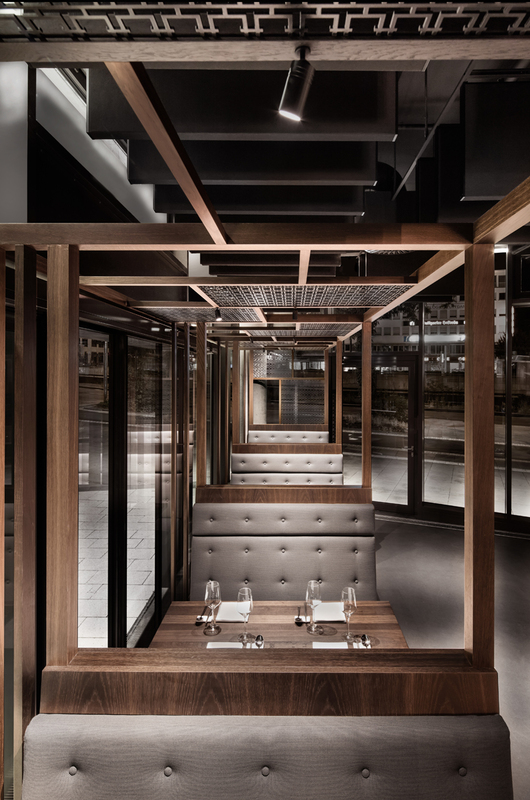 moveable tables and lighting make it possible to accommodate both small and large groups, with black sound baffles suspended from the open ceiling. 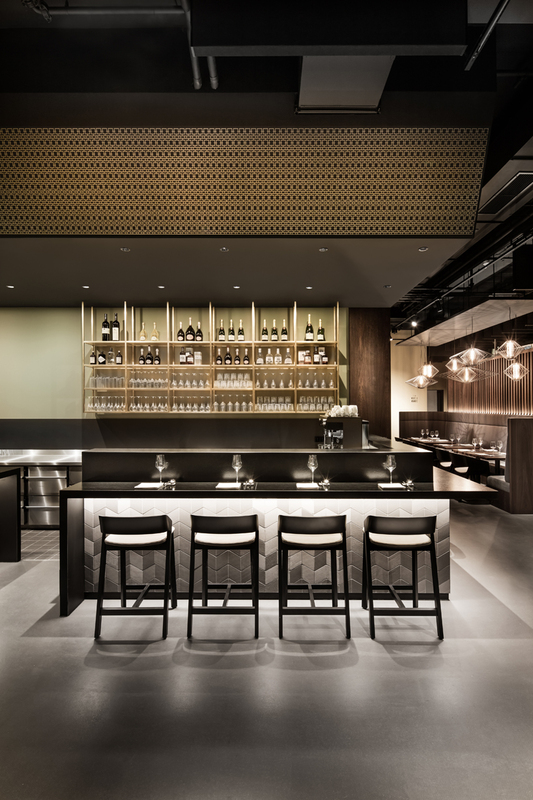 the bar and sushi counter elegantly form a stunning palette of color and material. the horizontal color transition from light to dark is subtle but eye-catching. the black ceiling panelling accentuates the slope of the glass façade and opens up the space. it also creates a backdrop for golden decorations that catch the light from different angles. the bar’s elegant brass shelf, placed on a covered green strip, also seems to come alive in the light. 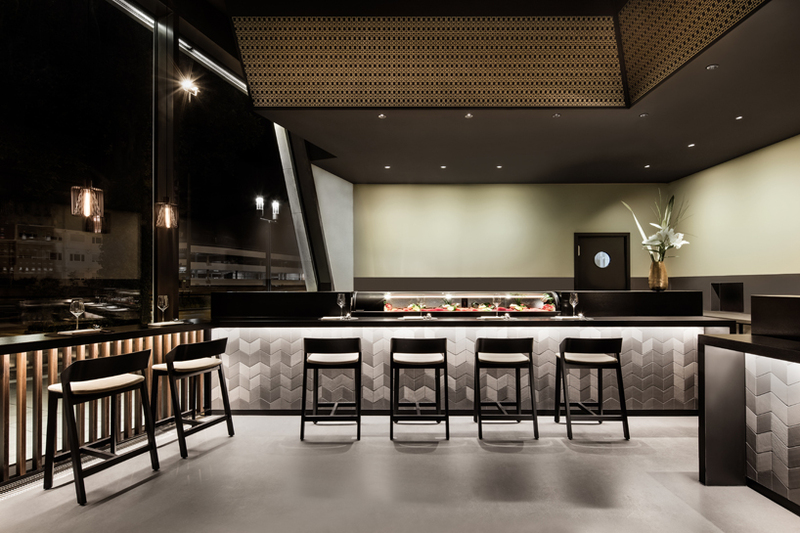 the solid stone counter, made with ‘nero assoluto’, accentuates the dark colors of the ceiling and answers for a stylish work and eating surface. the body of the counter is decorated in modern tiles, giving it an asian feel. the varying tones of grey give the surface structure a dynamic appearance. light wooden slats create a gentle transition from the solid counter at the window façade. 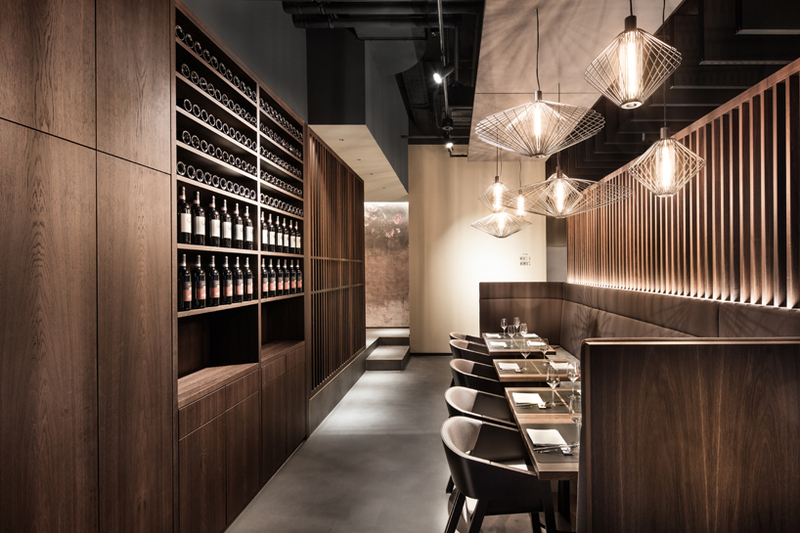 the stately wine cabinet to the right of the bar is made of vertical wooden slats and slightly conceals the private dining area of ‘enso sushi + grill’. 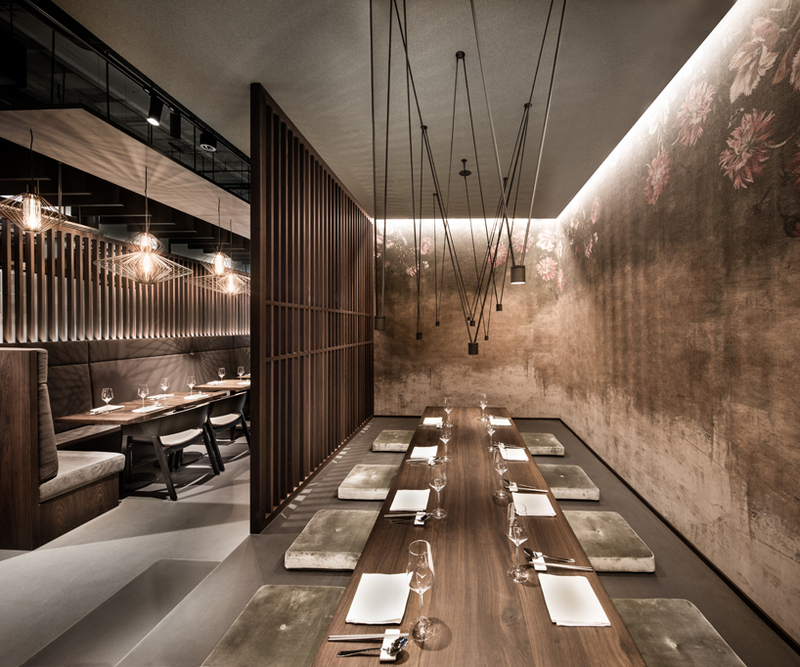 dittel architekten’s arrangement for these private areas give customers the feeling of being seated japanese-style on the floor, without having to give up the comfort of legroom. a sound baffle enhances the peaceful ambience, while stunning contrasts round out the distinctive atmosphere: floral wallpaper paired with raw, industrial-style floors and soft silk cushions paired with extravagant lighting. the rear end of the oak vestibule in the reception area has a cozy bench alcove with raised backrests and attractive pendant lamps. 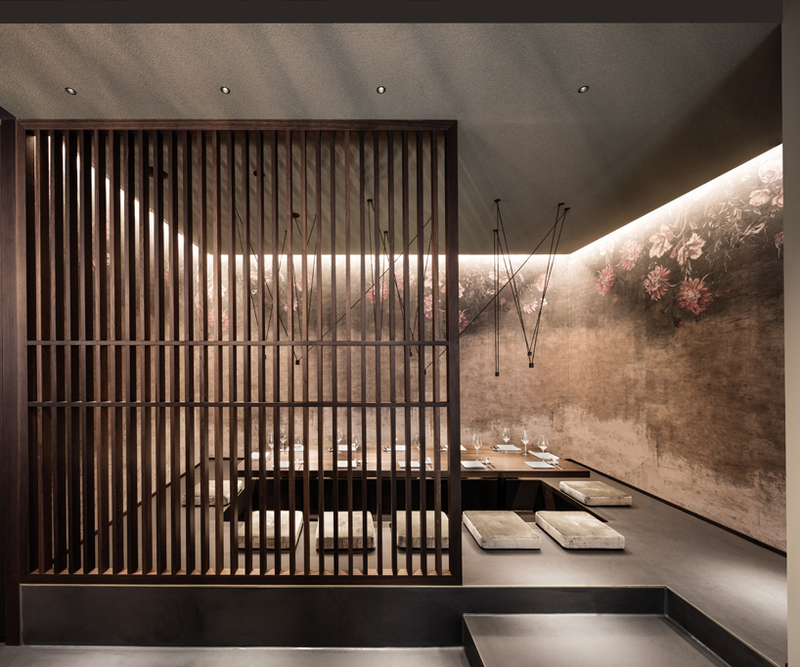 their shape hearkens to asian lanterns, a modern embodiment of this design concept. the décor has been perfectly conceived to the last detail, including tiled sinks with stylish brass fittings and atmospheric lighting.